Born: 9-20-1965 in Providence, R.I.
Current Life Purpose:(As of 11-6-2018) To heal and finish becoming the man I want to be, which is a really great husband, father and clear, present, free, powerful man full of masculine energy that people are attracted to & and are inspired by, and to be of service to the world through my music, writing, and presence. Ken LaVoie began playing guitar when he was ten years old, focusing on old folk tunes, beach boys and Elvis. In 1977, Ken moved to Rhode Island with his Dad who bought him his first guitar and introduced him to the more complex and emotional overtones of the blues and rock and roll. 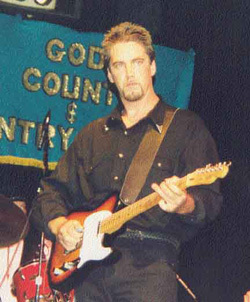 Ken remained a "closet musician" until 1997 when an employee of his lawn care company asked him to audition for the country band he was in, called "Cherokee". Ken did so and was accepted. He then spent the next 2 years transitioning from rock n roll and blues to the twang of country, trading in his Stratocaster for its simpler but twangier cousin the telecaster. CMOA Eagle award competition in Las Vegas. Cherokee continued its stealthy climb, gaining popularity and winning many state-level music awards from the Pine Tree State Country Music Association. In 1999, Ken won "instrumentalist of the year" from the same organization and was given the chance to compete, along with the Cherokee Band, in Las Vegas at the Country Music Organization of America's annual competition. Ken won "instrumentalist of the year" - his "crowing achievement". It was while in Las Vegas that he also met his future wife, Debbie Lee. Ken also operates Central Maine Web, which specializes in web design and hosting services. In early 2009, Ken and his wonderful wife Deb opened Southern Angel Properties, an apartment rental business.